The Confidence motorized treadmill makes them an affordable machine for every household. It is ideal for people new to running and those looking to shed a few extra pounds, and with it's folding design and wheels, it is easy to store and roll away. ToughTrain 4.0 out of 5 Can be a best deal in such a lower price. It has got average features. amazon.com 4.0 out of 5 This a really nice treadmill for home use. Very easy to assemble and for the price its very good as Manual treadmills cost around this amount. *Note: Most of the sites, stores or shopping portals listed above sell Confidence Fitness Motorized Treadmill with discounts and other exciting offers. 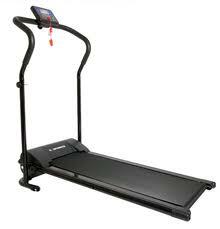 There is a possibility that the some of above websites are not selling Confidence Fitness Motorized Treadmill now. Toughtrain.com is not liable for such cases or instances. Also we do not recommend any seller for Confidence Fitness Motorized Treadmill and a buyer should buy from where he/she gets best deal with quality of products, service and on time delivery (shipment).